YNAB had been on my radar for a few years, though never enough to make me check it out. However, it got a whole new surge of buzz in December last year when they were launching a brand new online version of their software. I did some research, and learned that what makes YNAB different is that it is both a budget for what you plan to spend and a way to keep track of what you actually end up spending. 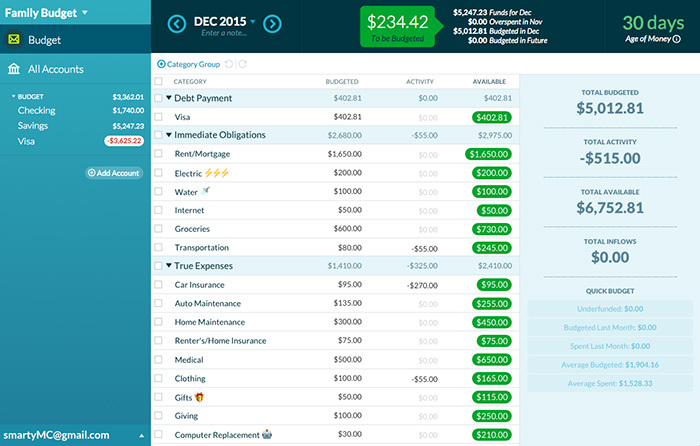 This way you can always check and make sure that your budget and your spending are aligned. It also refuses to deal with future hypothetical income, because you are only supposed to budget what you actually have. Know you’ll get that paycheck in 5 days? Too bad, you’ll have to wait another 5 days to enter it into your budget. We don’t play with pretend money. But before I ramble on about my experience with the software, here’s what makes YNAB’s method so different. As usual I will refer to money as “martian pesos” because it is my preferred imaginary currency. Give every dollar a job. This means that if you have 13.000 martian pesos in your bank account you are going to place those martian pesos into different categories in your budget until there’s nothing left. The idea is that if you know what each peso is supposed to do you will be much less likely to spend it on something else. Embrace your true expenses. 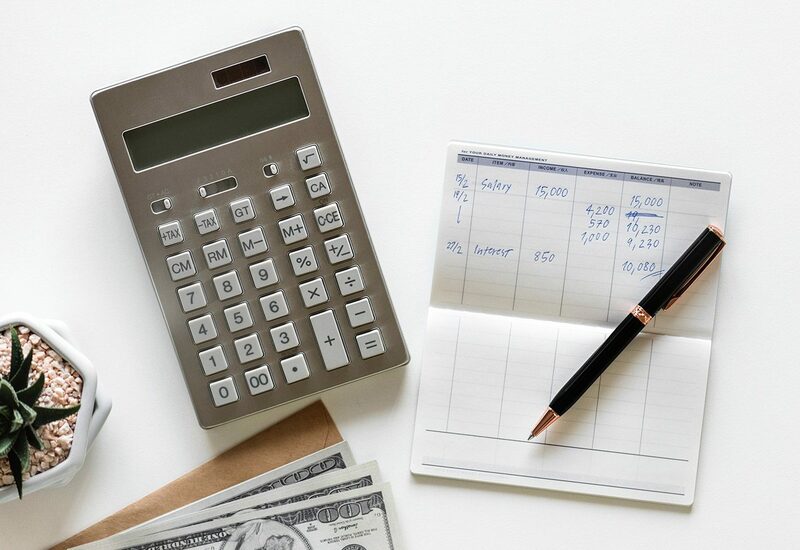 This is where you smooth out your cash flow by breaking down larger, less-frequent expenses, and treating them like monthly expenses by saving for them each month. You thought Christmas only came once a year? Wrong. You set aside money for Christmas every month. Birthday presents? Every month. Car repairs? Every month. Vet bills? You get the idea. Roll with the punches. You will go over budget sometimes. It happens. The idea is, if you overspend in your one category, like”groceries”, you will have to cover it by subtracting from another category, like “fun money”. This way you don’t overspend on your total budget, and you visually suffer the consequences by suddenly having less money in your “fun money” category. Smart? Yes. Age your money. How old is the oldest martian peso in your bank account? YNAB will tell you. The basic goal is to have money that is 30 days old, which means you could get by for a month without income at your current spending rate. This won’t be the case for everyone of course, but it is a nice goal to have. It is also a smart little piece of gamification: you’ll want to see that number grow. I have used YNAB religiously since January 1st, so I’m writing this after using it as my only budgeting tool for 7 months. It is kind of amazing. I have never had this much control of my finances, and I have never been this motivated to save. I don’t really have unforeseen expenses anymore, and when they do pop up it is no biggie. It also gives me a pretty brutal overview over what I spend money on, which in turn motivates me to make changes for the better. You might be hesitant to sign up because it is a subscription service with a monthly ($5) or yearly ($50) fee, but trust me when I say that in the long run YNAB pays for itself. And when I say “in the long run”, I mean within a month or two. It’s that good. With the 34 day free trial you will have plenty of time to test it out before you decide to commit, and I strongly urge you to give it a go. In the end, if you use YNAB correctly, you will consult the YNAB app before you make spending decisions instead of checking your bank account. P.S: I have a referral link. If you sign up using it we both get a free month of YNAB. Jeg liker konseptet med YNAB, men synes det er litt knotete å skulle føre alt manuelt siden den ikke synkroniserer med norske banker. Det er jo selvsagt ikke mer jobb enn å føre excel sheet selv, men føler man mister en del av den automatiske delen av det. Jeg har endt opp med å bare dele opp alt selv når jeg får inn lønning, jeg legger av til sparing (20%), pensjon, BSU samme dag og trekker ut alle utfgiftene mine hver månend til en separat “Regninger” konto hvor alt går ut automatisk med avtalegiroer. Resten kan brukes som “spending money” i brukskonto. Jeg liker at jeg må taste alt inn manuelt, utrolig nok. Da blir man veldig bevisst på hva man har brukt og hva man har brukt det på. Men jeg skjønner veldig godt at andre kan synes det blir for knotete! Ja, det er jo forsåvidt sant. Vil tro det ikke blir så mye jobb om man fører i appen fra dag til dag. – Kan flere i en husholdning logge i samme budsjett/regnskap? – Hva er prisen pr mnd? – Jepp, de kjører Netflix-modellen, altså at hele husholdningen kan dele samme innlogging. Da kan alle du ønsker ha tilgang til alle budsjettene på den brukerkontoen. – $5 per måned, eller $50 per år! Hmmmm. Jeg skal begynne å studere og gå fra full inntekt til halv inntekt, så jeg burde jo virkelig begynne å bruke et budsjett… Takk for masse gode tips! Hi Maja, my technical comprehension is horrible (social sciences, lol) (see, perhaps that’s the reason why I’m unable to watch my budget) so when it comes to using some apps or whatever, I often rely on recommendation of people I trust. I really need to keep track of my financial situation but my boyfriend discouraged me from using an app as it could be dangerous because you never know where your personal data ends, etc. etc. Can you give some advice on this please? Is the YNAB safe? Sorry if I ask stupid questions, it’s just the granny inside me that is surprised by how little privacy there is in these internet days. Hi Zia! You can only connect your bank directly to YNAB if you live in the US or Canada, and even if you do live there it is completely optional. You don’t have to connect anything to YNAB if you don’t want to. I do everything manually and prefer it that way. If someone should manage to get into my YNAB account they would get a complete overview over how much money and debt I have, but they wouldn’t have actual access to any of it, as they are just numbers that I have punched into their app. Personally I would have liked it if they added 2 factor authentication, but I’m sure that will be added somewhere along the line. I’ve been wanting to try it but I am worried that it’s not compatible with non-US banks. As you are not American (obv), are you having any troubles with exporting data from your bank to the software?